The Eredivisie campaign may be a days away but Feyenoord’s season is already underway as the club is bidding to reach the Champions League group stages by overcoming Turkey’s Beşiktaş in the Champions League third round second leg. The Dutch club are facing an uphill task to overcome Slaven Bilic’s men after losing 1-2 in the first leg at the Feijenoord Stadion last Wednesday. Despite Holland’s successful World Cup campaign, Feyenoord have been the club affected by the national teams success as manager Louis Van Gaal’s defensive trio of Daryl Janmaat, Bruno Martins Indi and Stefan de Vrij have all moved onwards and left the club after some incredible defensive performances to help The Netherlands finish third in the tournament. Fred Rutten has a much larger task in replacing Italian goal-getter Graziano Pellé who left for Southampton in July. In recent weeks, midfield dynamo Jordy Clasie has been linked with moves to Manchester United since Van Gaal has taken over at Old Trafford. Despite the losses of key defenders, Rutten can call upon experienced international defenders in Joris Mathijsen and former-Chelsea defender, Khalid Boulahrouz. Terence Kongolo (the older brother of Manchester City academy player Rodney) is expected to start at left-back as Rutten attempts to overcome last week’s defeat 1-2, and qualify Feyenoord for the group stages for the first time since 2008. Beşiktaş are looking to reach the group stages of the Champions League with new signing Demba Ba, whose £7million move from Chelsea shocked many in the footballing world including those most loyal to the Turkish outfit. 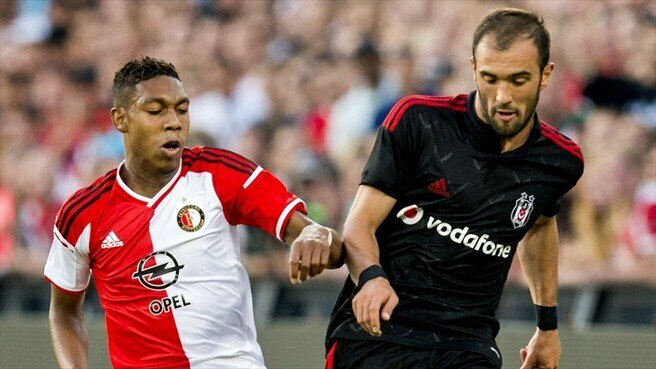 Bilic’s men are looking to withhold Feyenoord’s attacking threat as his side have to defend a one goal lead after Mitchell Te Vrede’s last minute penalty halved the deficit and handed Feyenoord an incentive despite having a two goal advantage. Demba Ba isn’t the team’s only threat as Dutch-born midfielder Oguzhan Ozyakup is making quite a name for himself with some majestic performances both domestically and in Europe for Beşiktaş. Ozyakup’s creative awareness and Demba Ba’s phenomenal goal scoring record will give Feyenoord boss, Fred Rutten, an extra worry in attack as his side will be weary of leaving too much space at the back. John Guidetti is being heavily linked with a return to Feyenoord, in recent times, after a successful loan spell in 2011/2012 that seen him reach heroic status when the Swede famously scored a hat-trick against bitter rivals, Ajax. There is no denying that Rutten’s task of overcoming last week’s defeat is going to be extremely difficult when he takes his side to Istanbul and the hostile Inonu stadium. Bilic’s Beşiktaş have become quite a force since the Croatian’s appointment to the hot-seat in 2013. Having previously created an enormous reputation whilst manager of Croatia he has seen his side’s lose only on rare occasions no side will want to face the Turkish outfit should they advance to the group-stages. The current set up in Turkey has seen his side labelled ‘Dortmund Like’ in recent weeks because of their lightening fast build-up play. Bet Victor are offering 10/1 for a Besiktas 2-0 win and that is my prediction for this one unfortunately. My bias opinion would love to see the Rotterdammers advance to the group-stages of the Champions League but last week’s defeat and the electric pace in the Beşiktaş side, sadly I feel we will probably see the Dutch side crash out in Istanbul. TIP: Beşiktaş to win 2-0 (10/1 – Bet Victor) – Click here to join Bet Victor and claim up to £25 in free bets!!! ← PSV Eindhoven – Eredivisie champions 2014/2015?